Rebecca Beatrice Brooks December 12, 2011 June 7, 2018 2 Comments on What Was the Stamp Act? The Stamp Act of 1765 was a law passed by Parliament taxing all paper used for printed materials in the colonies. The Stamp Act was passed on March 22, 1765 but it didn’t take effect until November 1 of 1765. 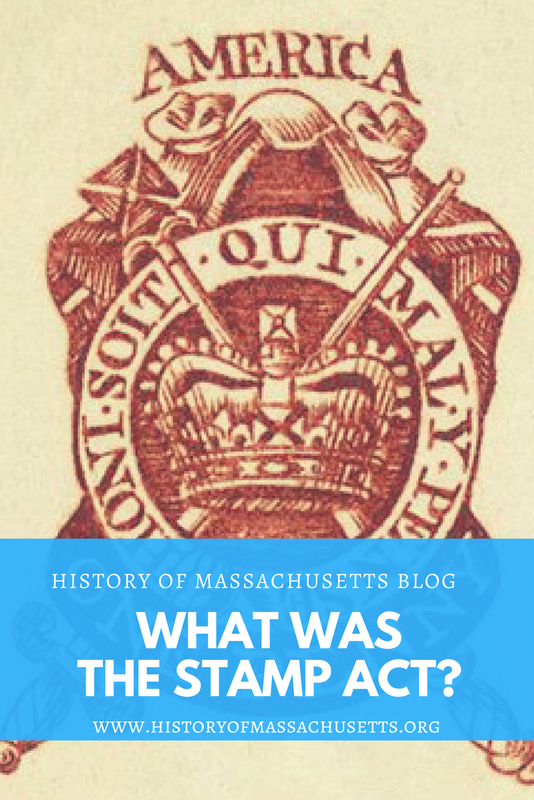 The Stamp Act was an act passed by Parliament that required that all materials printed in the colonies be printed on paper embossed with an official revenue stamp. These printed materials included magazines, newsletters, legal documents and newspapers. 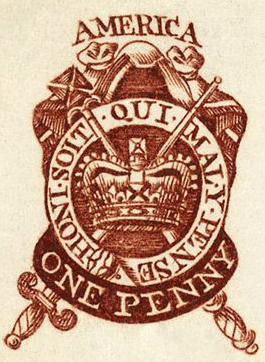 The purpose of the Stamp Act was to generate revenue to pay down Great Britain’s war debt from the French and Indian War and to raise money for British troops who were stationed in North America in order to protect the new land won in the war and prevent uprising from the French colonists living there. Parliament felt that since colonists would benefit the most from the protective presence of the soldiers, they should pay for the cost. The colonist’s reaction to the Stamp Act was one of anger and outrage. Many felt it was a blatant attempt to make money off the colony. Although the price of the stamps was actually very little, the colonists worried that if they allowed this law to happen, there would be plenty more to follow. They understood the significance of the Stamp Act and knew that it had the potential to lead to even more abuse of power by the British government in the future. Political groups, such as the Sons of Liberty, held public protests that often turned violent and destructive. Riots occurred in New Hampshire, Maine, New York, Connecticut, Pennsylvania, Rhode Island and Massachusetts. 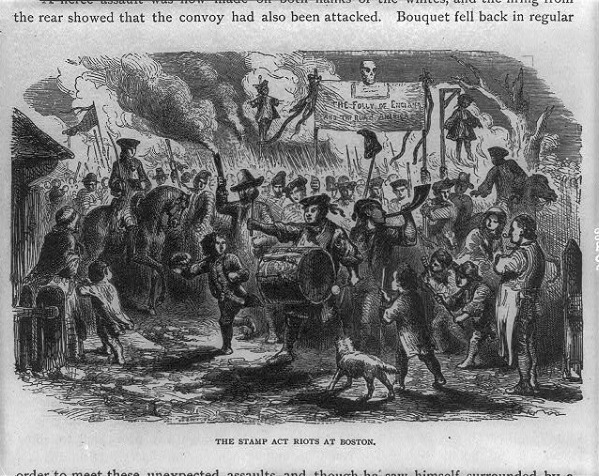 In August of 1765, a number of particularly destructive riots took place in Boston, during which mobs threatened to tar and feathered tax collectors, hung an effigy of tax commissioner Andrew Oliver from the Liberty tree on Boston common, looted Oliver’s home and office, burned down his stable along with his coach and chaise, and looted and damaged the mansion of the Governor of Massachusetts, Thomas Hutchinson, as well as the homes of a number of other customs officials. 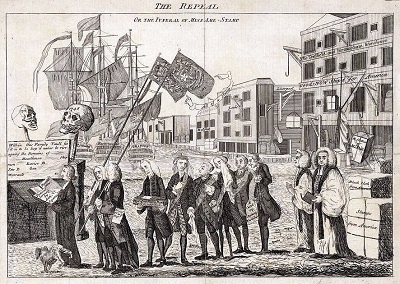 “The Repeal, or the Funeral Procession, of Miss America Stamp,” cartoon depicting the repeal of the Stamp Act, circa 1766. The coffin is carried by George Grenville, who is followed by Bute, the Duke of Bedford, Temple, Halifax, Sandwich, and two bishops. American merchants joined in on the cause by organizing nonimportation associations to pressure British exporters to rally against the Stamp Act. Since one-quarter of all British exports were sold in the colonies, they reasoned that a boycott of their goods would hurt British merchants financially and force them to join the cause. Widespread celebrations were planned throughout Boston and the colonies to commemorate the repeal, which included fireworks, celebratory cannon fire, bonfires and decorating ships and houses in flags and streamers. The celebrations were shortsighted though since what the colonists didn’t realize at the time was that the Declaratory Act would later pave the way for Parliament to pass even more acts during the American Revolution, such as the Townshend Acts, that would once again threaten the colonist’s autonomy and way of life and would continue the American Revolution in Massachusetts. Hi Rebecca, once again a brilliant article. This gives me a certain insight to my great grandfather’s situation, as the printer of the Boston Gazette and Country Journal and the impact that this would have had on his business. I have seen advertisements and requests from his time, asking for rags and cloths to help supplement his manufacturing of paper for printing. It is interesting to note that in Australia where I live we still have ‘stamp duty’ on official documents, such as conveyancing documents for real estate and other instruments of an official or legal nature.